Welcome to my build of the SIG - Astro Hog. Radio installation. Managed to get it to balanc without any additional lead, but I had to use a 5 cell 2/3 pack, tucked in the nose. Should be able to fly for hours on that. Looks a bit bare, so might add some trim ata a later date. 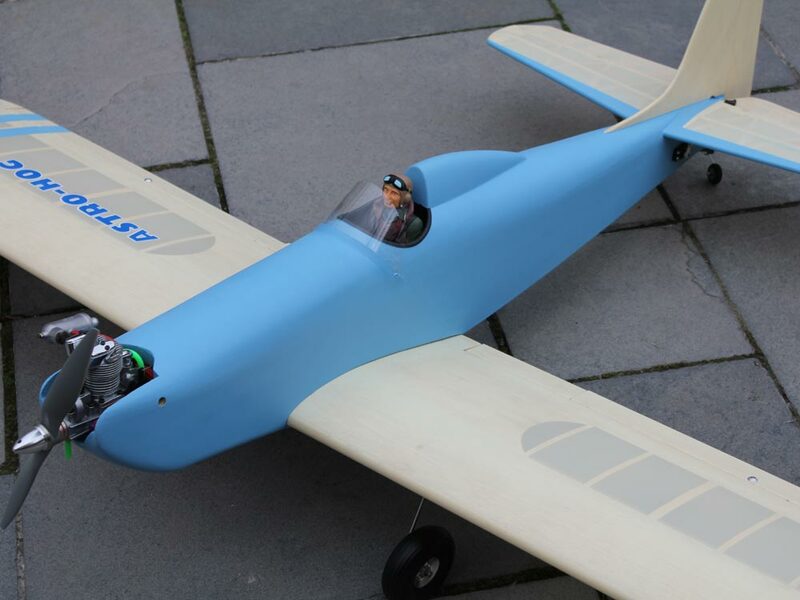 The model painted in Klass Kote matt blue. I messed this up on the first go, Thought it was too much trouble to get the spray equipment out so attmpted to paint it. 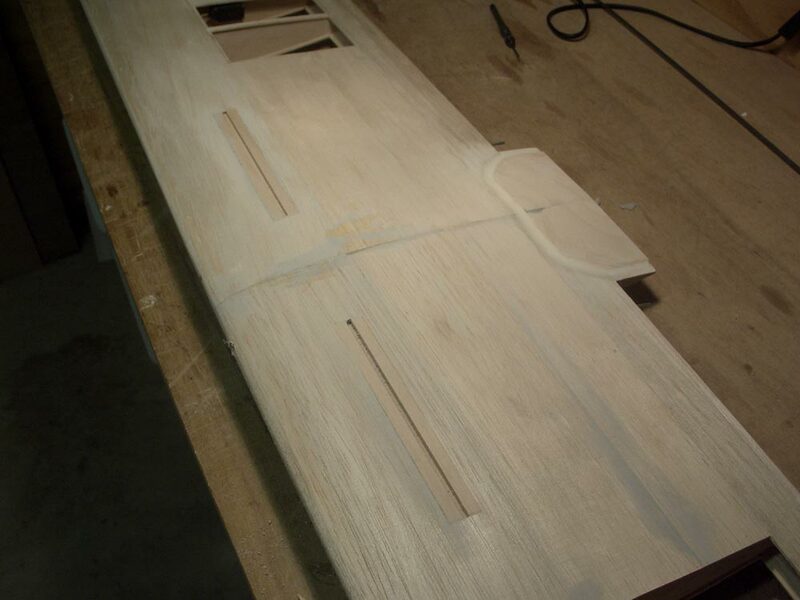 Ended up with brush marks in the finish. Now this was nothing to do with the Klass Kote paint and more to do with me rushing things & not mixing the paint to the right consistancy. Ended up sanding it back as far as I could and spraying. 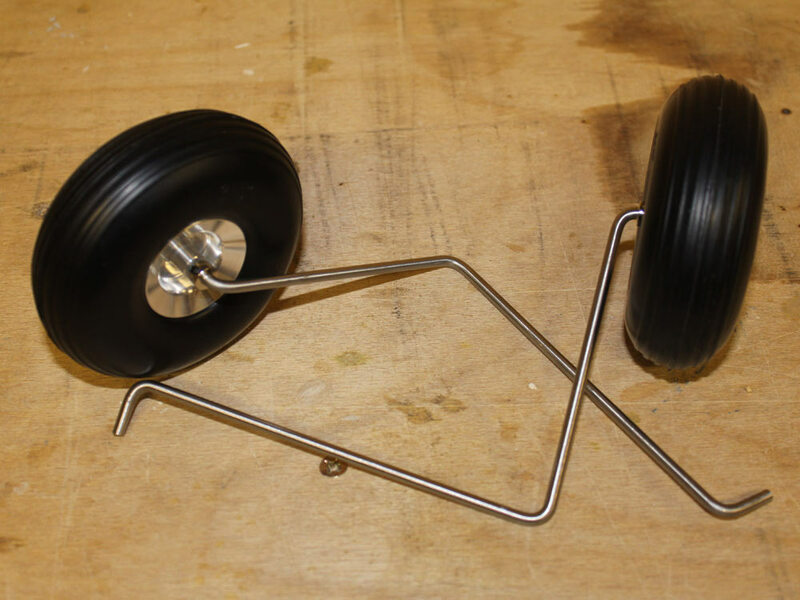 The kit is supplied with pre bent undercarriage for the trike version. 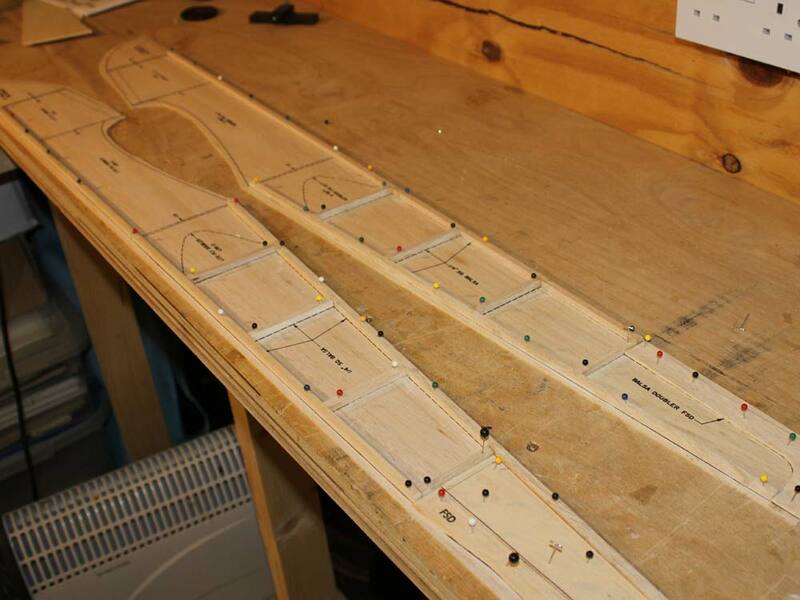 As I'm building the tail dragger I need to remake the undercarrage. 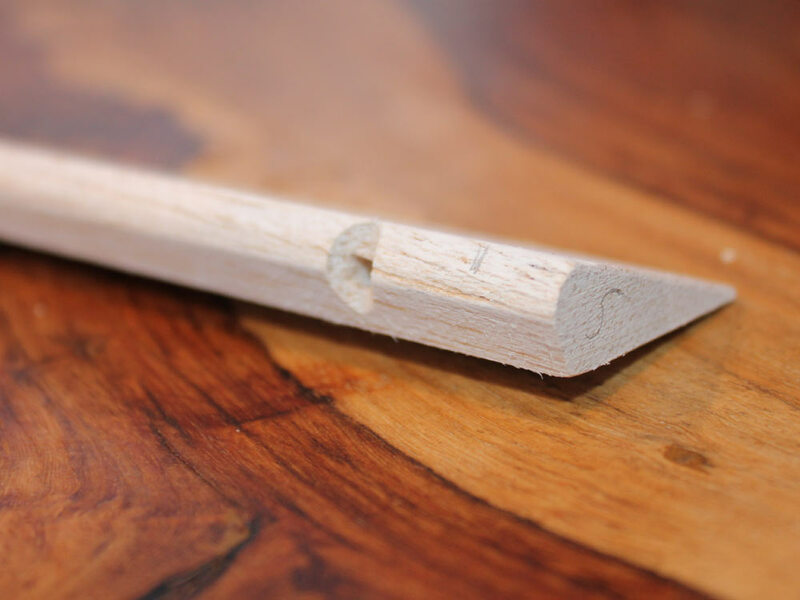 A simple job with the right tools. Here you can see my 30 year old wire bender. A pattern is shown on the plan, but its not important to exactly match the drawing, rather making 2 the same is important. 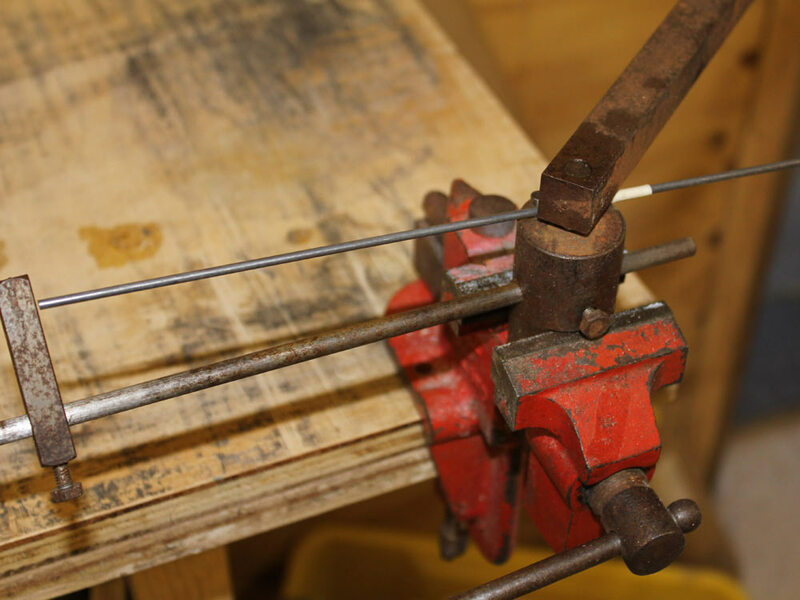 I set the stops on the bender and made 2 at the same time, by starting the bending at each end of the wire. 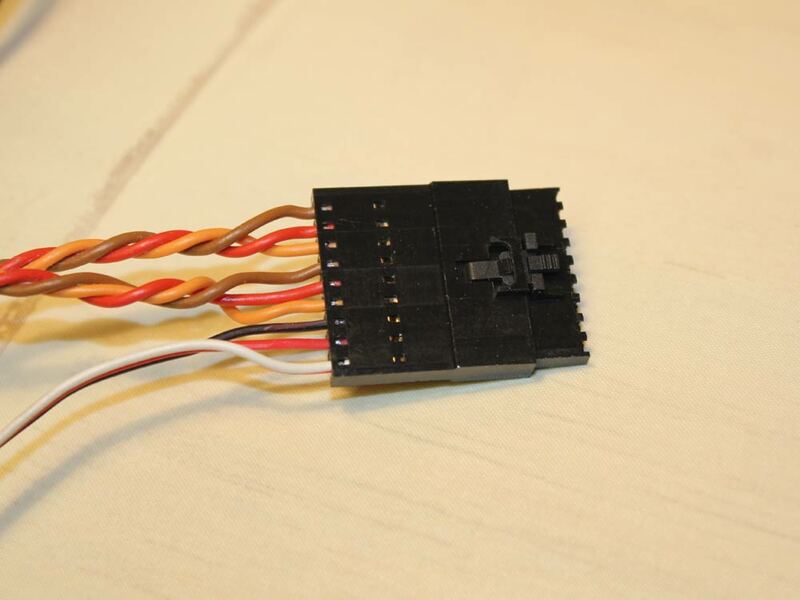 The final image above shows a 9 way Ashlok connector for the 3 wing servos. 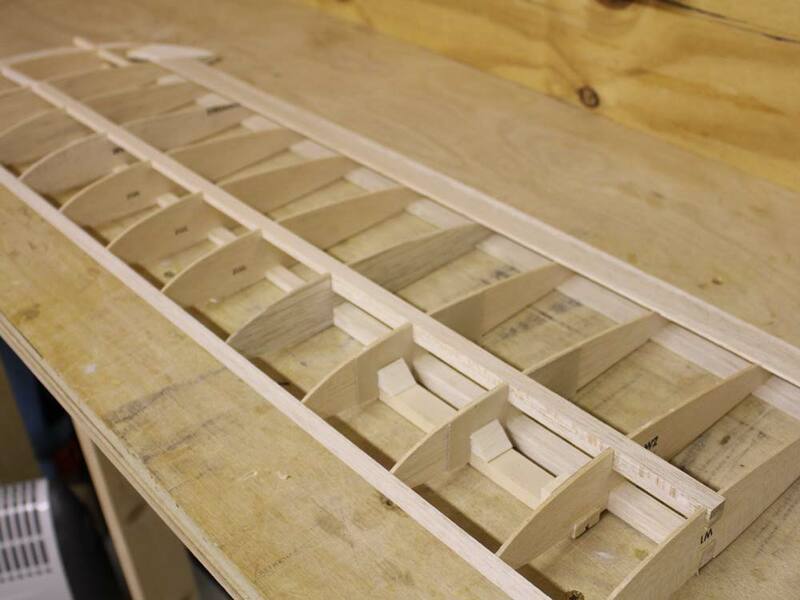 that 2 ailerons & flap. 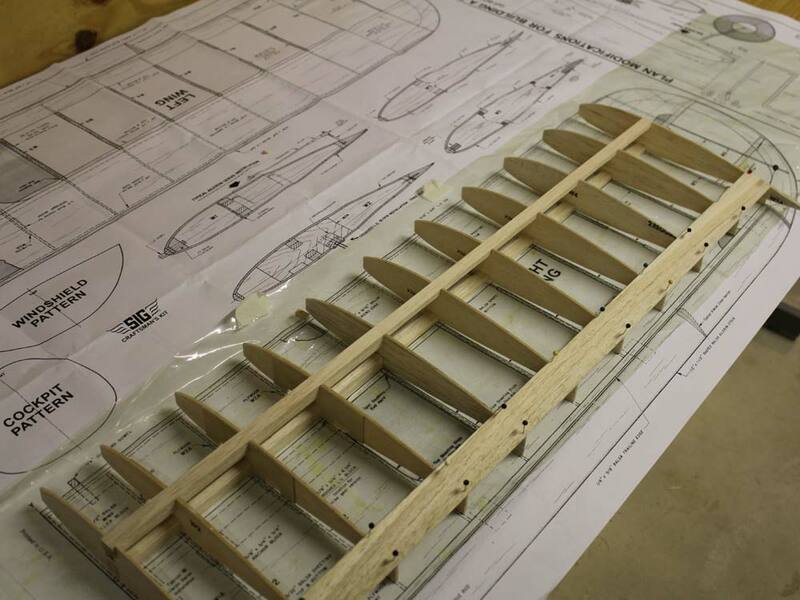 Wings now ready for covering, Should have fitted the flaps and ailerons for the picture. 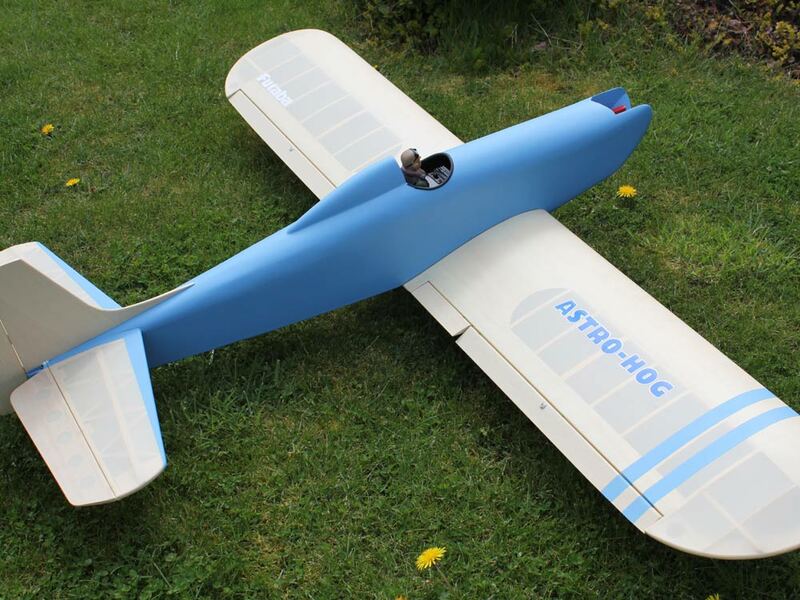 Covering will have to wait until after next club night, where I'll be displaying the open airframe. The second pic shows the extent of the glass cloth, not just around the centre section but also along the undercarriage mounts. 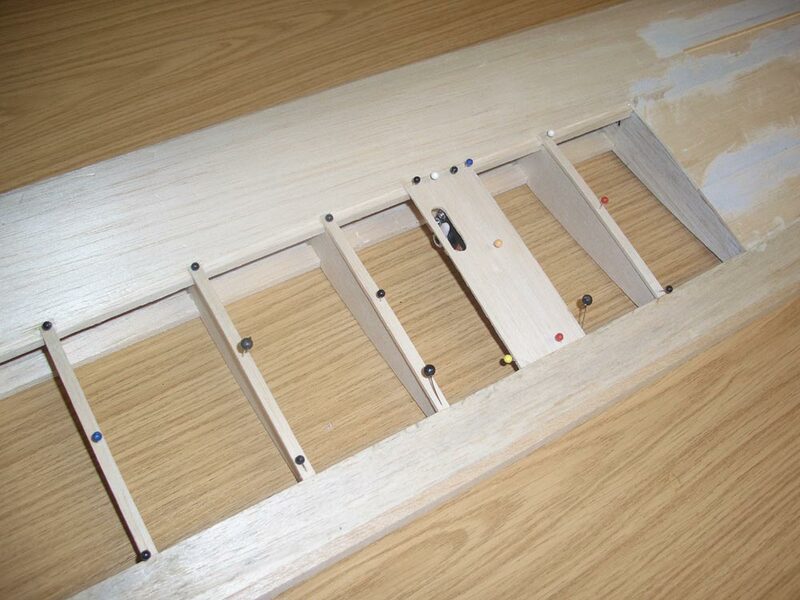 Final picture here shows the flap, note the chamfer to get full down flap movement and the hole for the Robart Pin hinge. 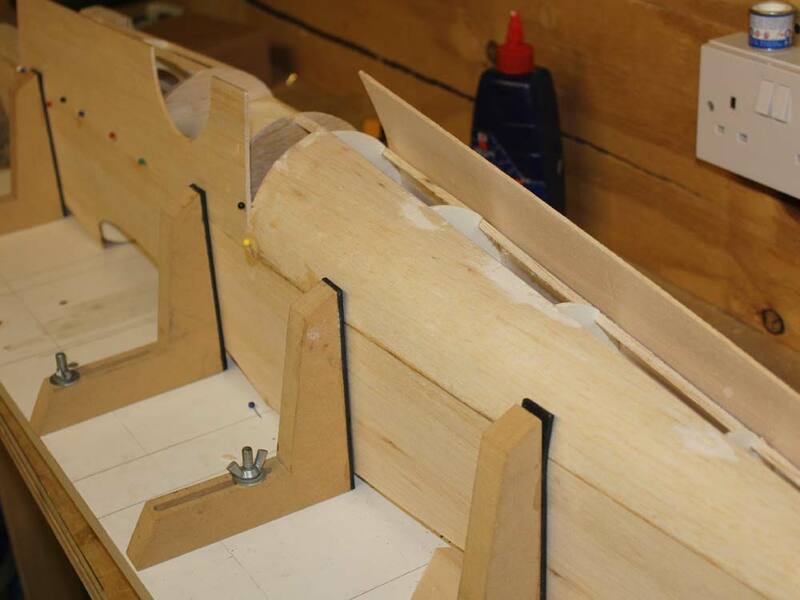 The first 2 images are the complete fuselage ready for final sanding. 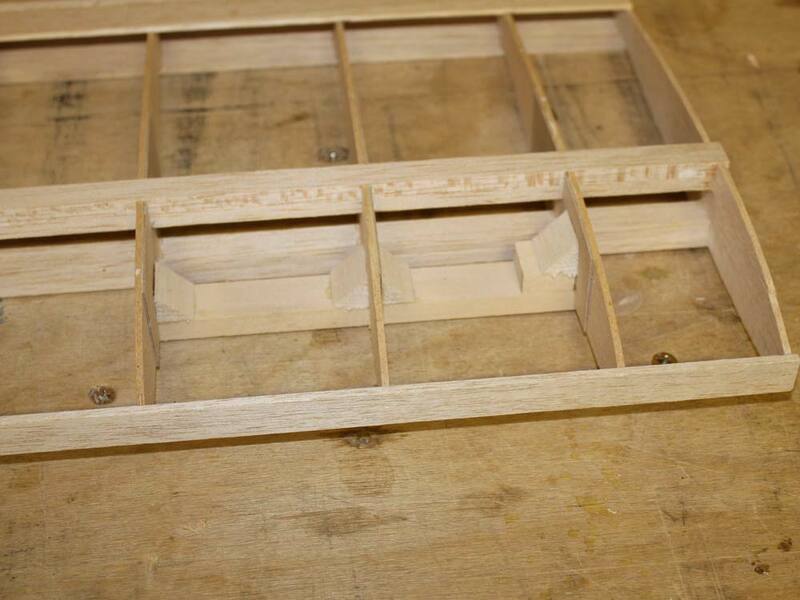 I'll be making some lightening holes prior to covering, the 3rd image is of the wing ready to have the glass cloth applied. I dont like the 2" cloth that comes with the kit, I have some 4" so I'll be using that for the centre section, and use the 2" to tie in to the undercarriage blocks. 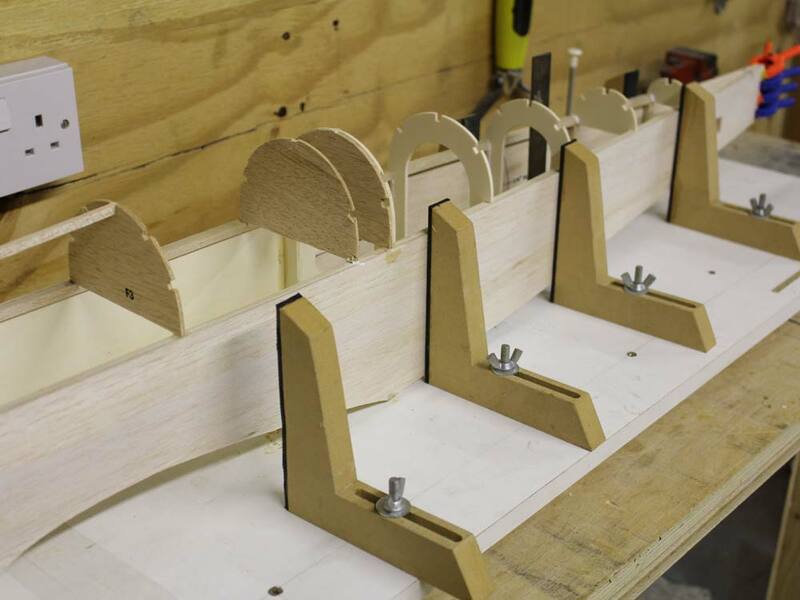 When all the bits are ready for final covering, I'll weigh them so you can compare to your builds. Tailpalne being built over the plan, What you can't see here is just how cold it . 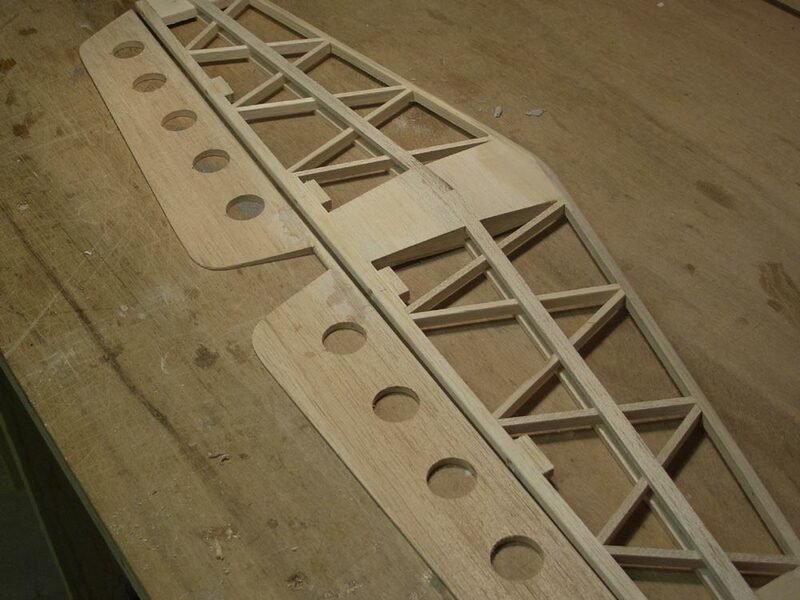 Second image is the complete tailplane, I've said before that the wood selection in the kit is quite poor, but none so bad as the elevators, these are so hard and heavy as to be almost spruce-like. I have tried to lighten with holes, but still not sure whether to use or not. Capping strips now, notice the extra wide one for the servo pushrod exit. 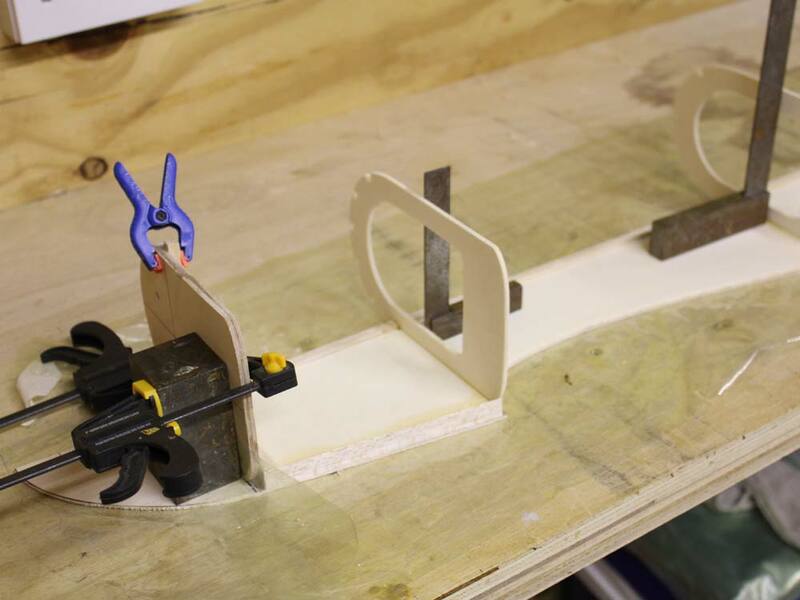 My method for fitting the wing servos is to have 2 1/8 lite ply half ribs, glued each side of a main rib. This worked well on the Super 60. 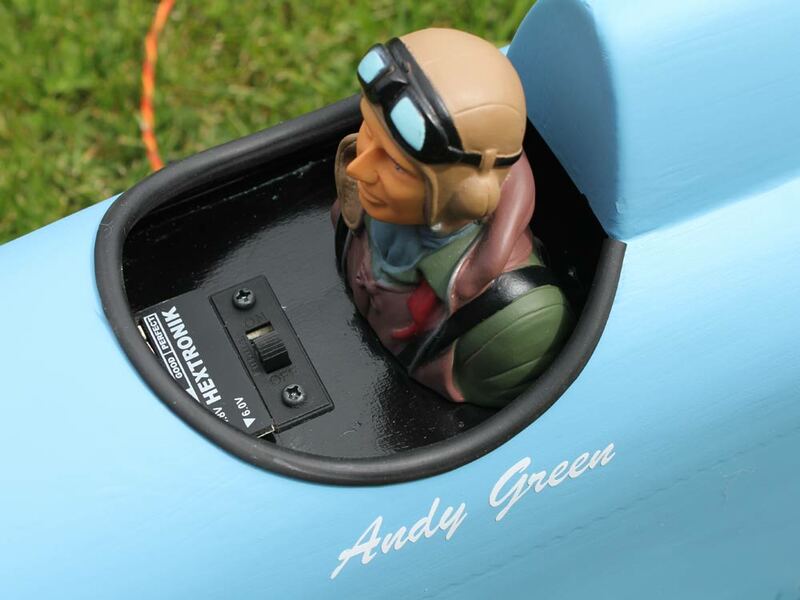 I does mean that the servo is built into the wing which makes maintenance harder, but I can count the times on 1 hand that I've had a servo failure in 30 years of R/C. 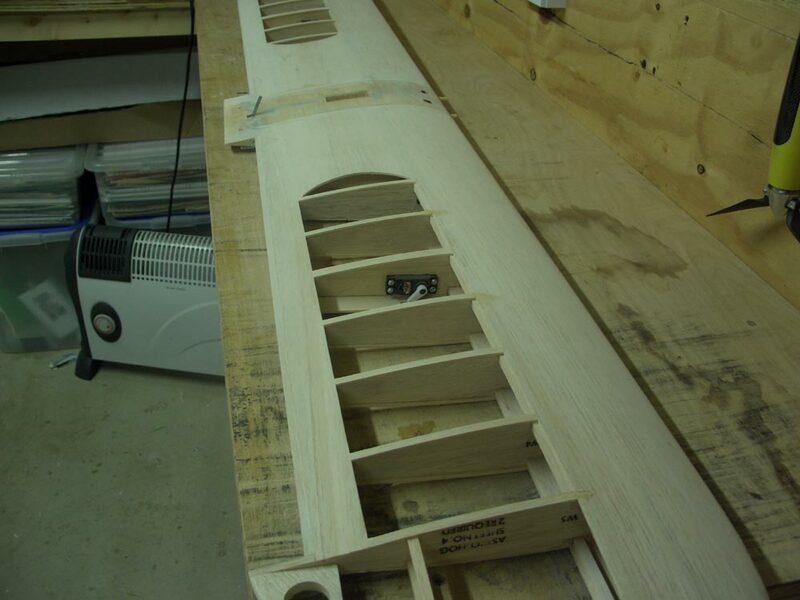 The second picture shows the wing panel with the bottom sheeting, you can just see the servo hole in the rib at the top. 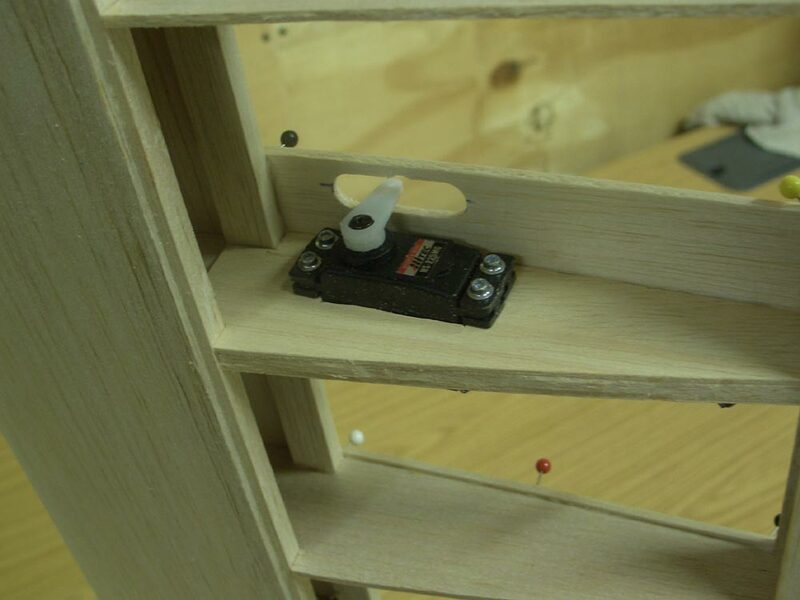 I'll make some servo extentions and get the servos fitted while I have full access. I'm going to be using Hi Tec 225MG servos. 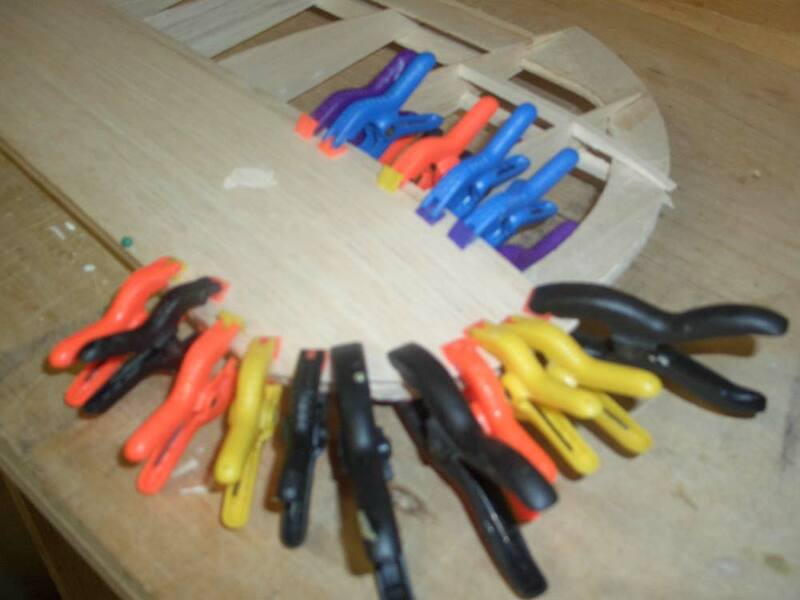 The first picture shows just how many clamps are needed to hold the wingtips whilst the glue dries. 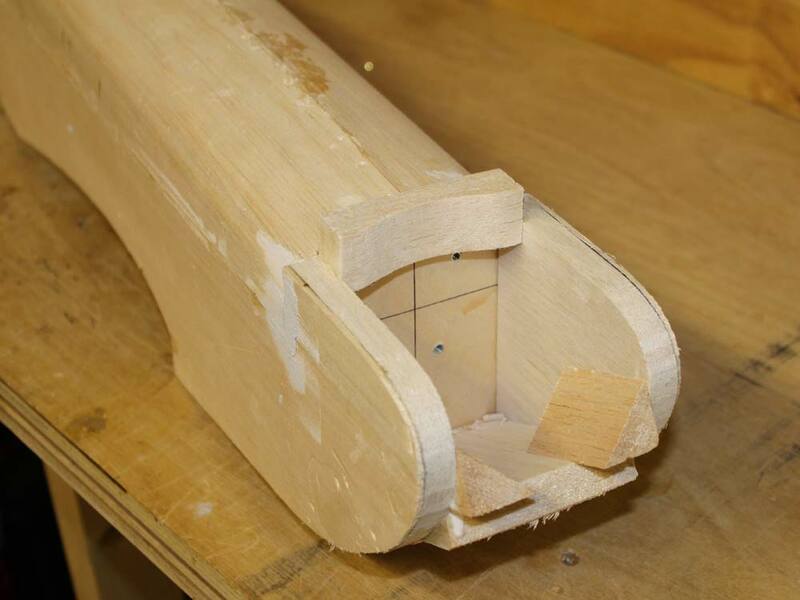 I used white glue for gluing to the spars, but around the tip I used Gorilla glue, this expands and will fill any gap between the sheeting and the tip structure. 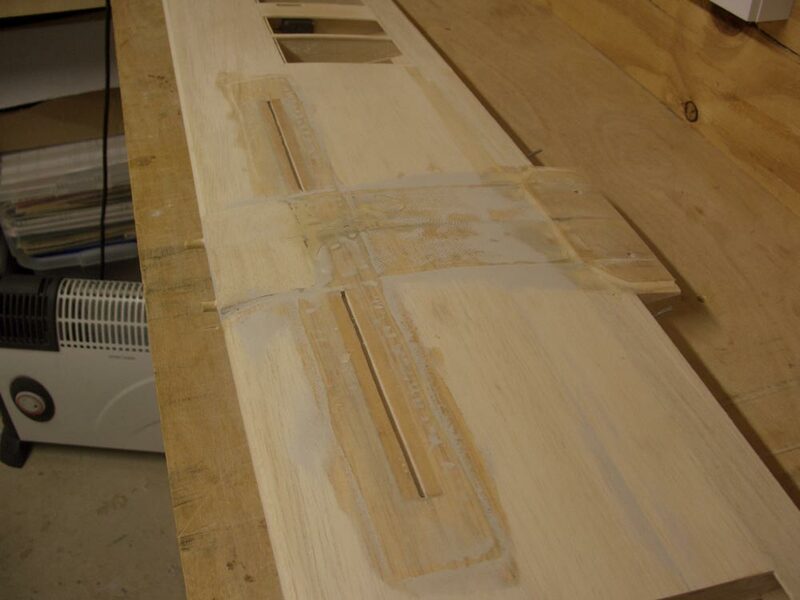 This just means if I sand a bit too hard and go through the wood, there will be something there. 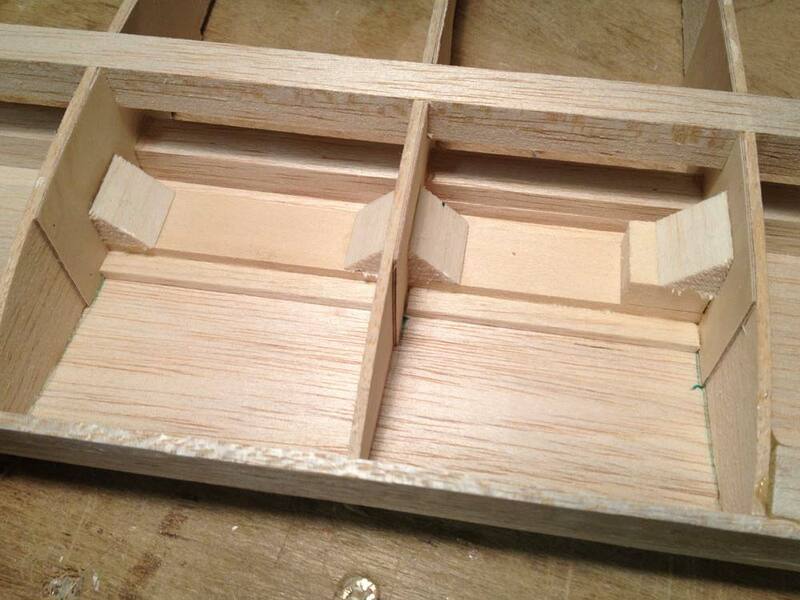 The second picture shows the forward mounted undercarriage block. No mention is made of how to sheet this forward position in the instructions, I just placed the sheeting on and drew around the block. 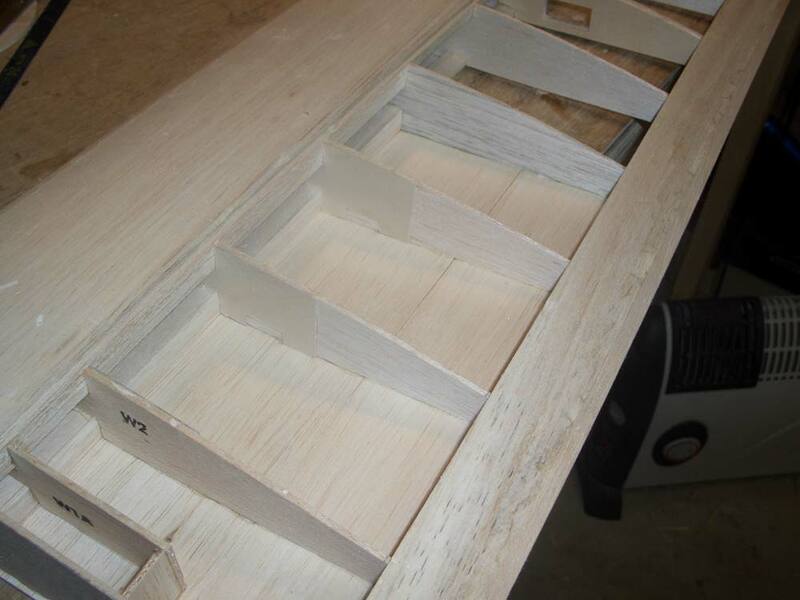 I then added some 1/8 strip around the sheeting to make sure the block / sheeting jpoint was secure. 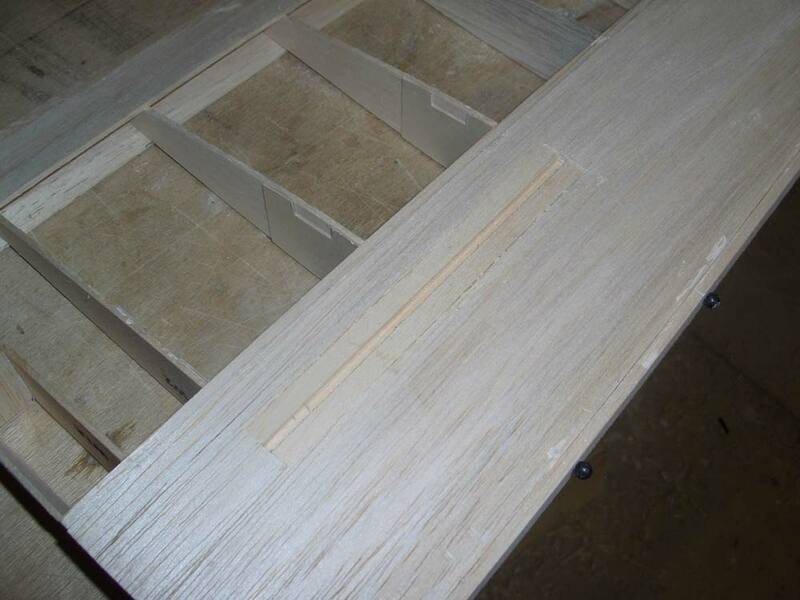 When I join the wings, the external area will get a strip of glass cloth covering, to just make sure its secure. This worked well on the Chipmunk. 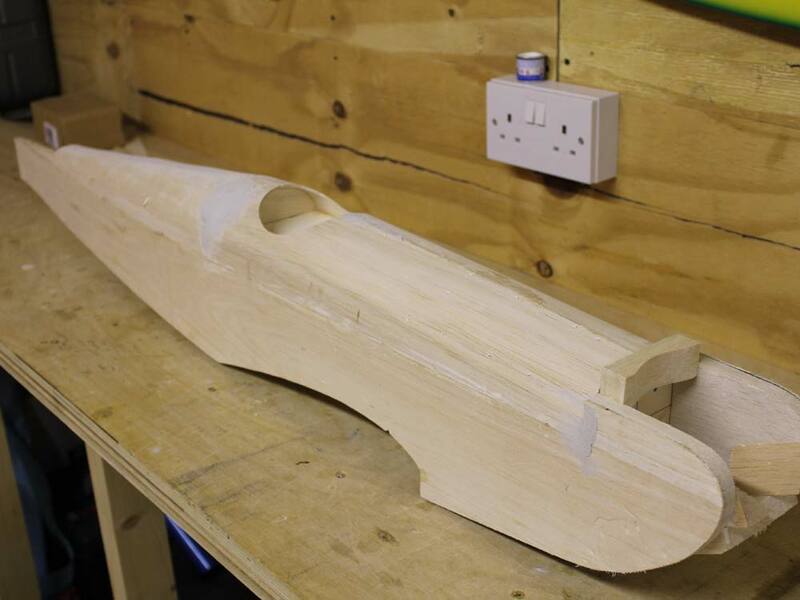 Top & bottom sheeting all done, and the nose blocks in place ready for shaping. 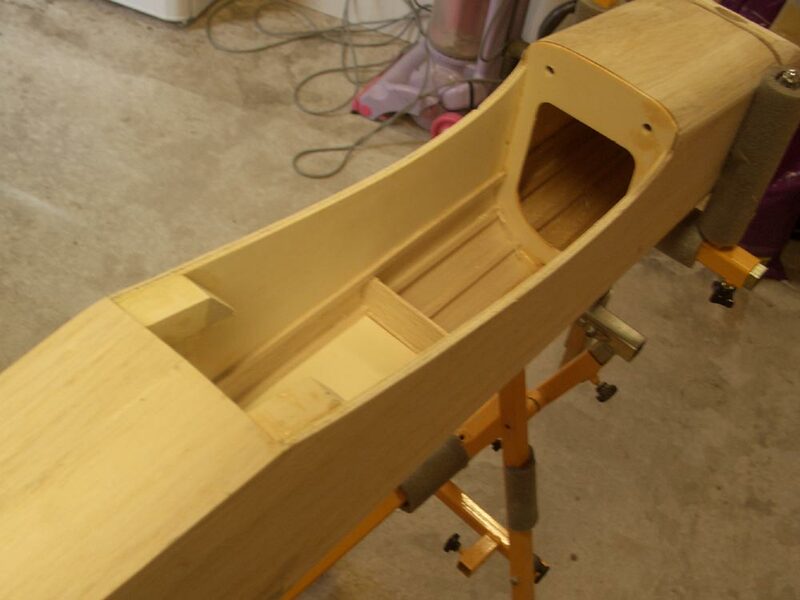 Inside the nose area I have glassed the tank area and run some glass cloth to join the fuselage side to F1. 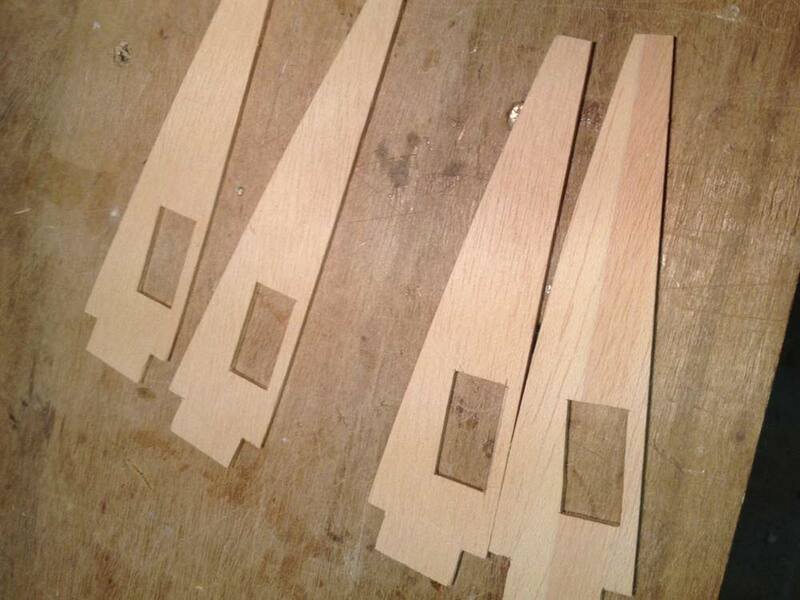 Wing panels made over plans as per instructions, nothing much to note, except I have some triangle fillets on the U/C to rib joints, just to make sure. 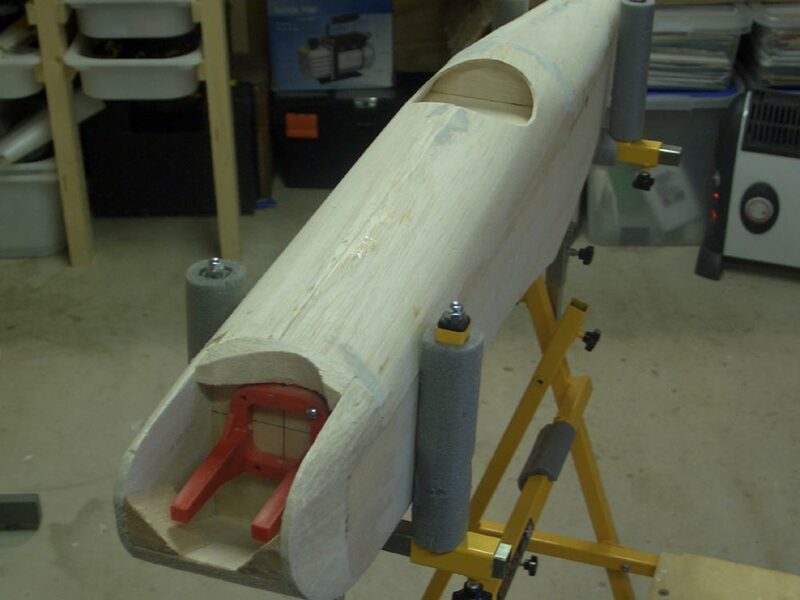 Fuselage in jig, I have also kept it held firm in the jig while the top sheeting is applied. F1 at this stage has the captive nuts for the enging mount. 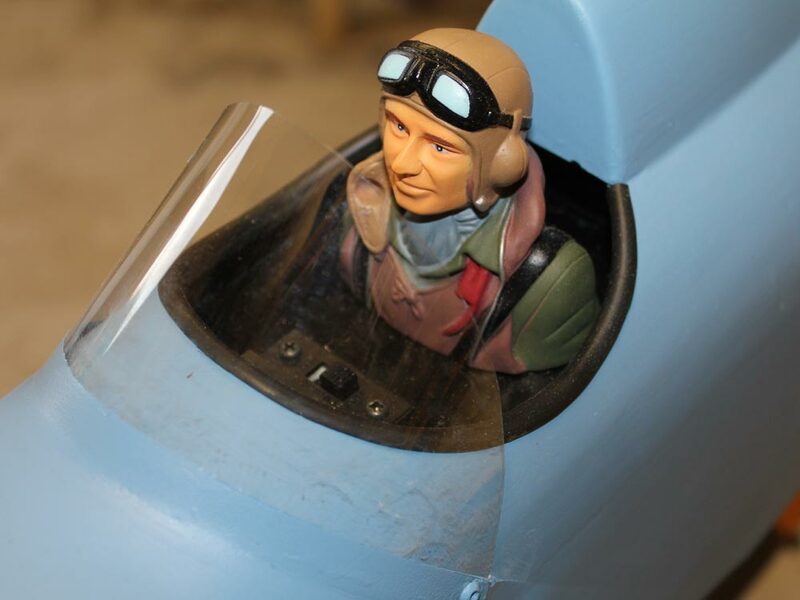 One advantage of the cold weather is even 5 min epoxy has some working time. 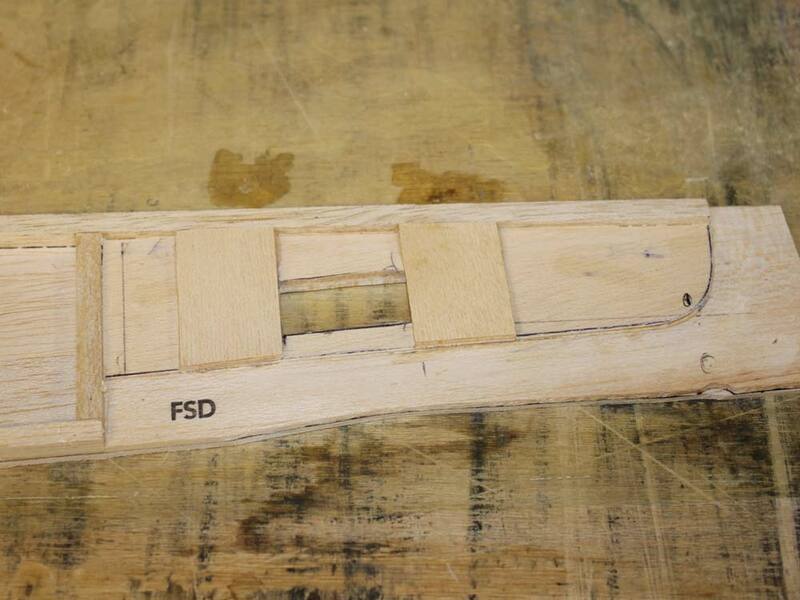 My first impressions of the kit was very good, but on closer inspection the balsa is quite old. 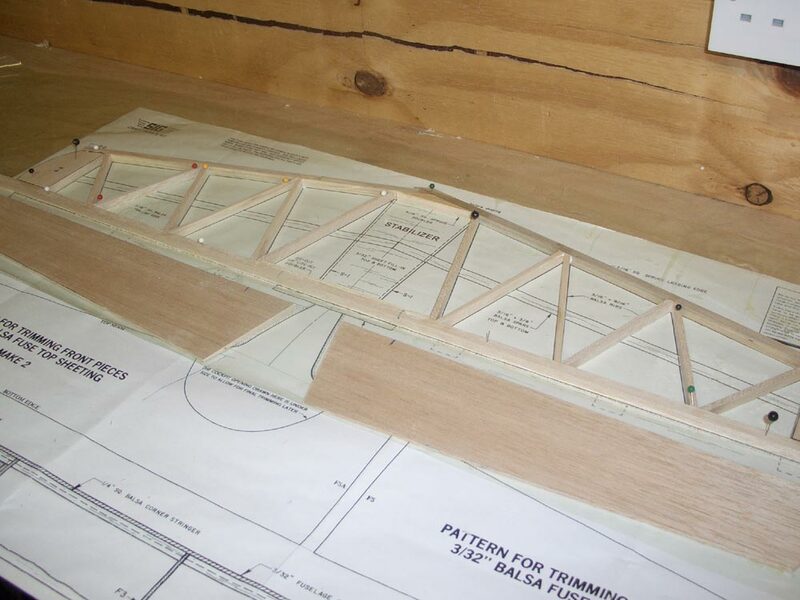 Its difficult to explain unless you have experience of old balsa, but it goes brittle-ish. I think I might have to change my engine choice. I have an old OS 60 FS but its a bit bigger than I remember, so I might fit a Saito 62 I have waiting for e new home. 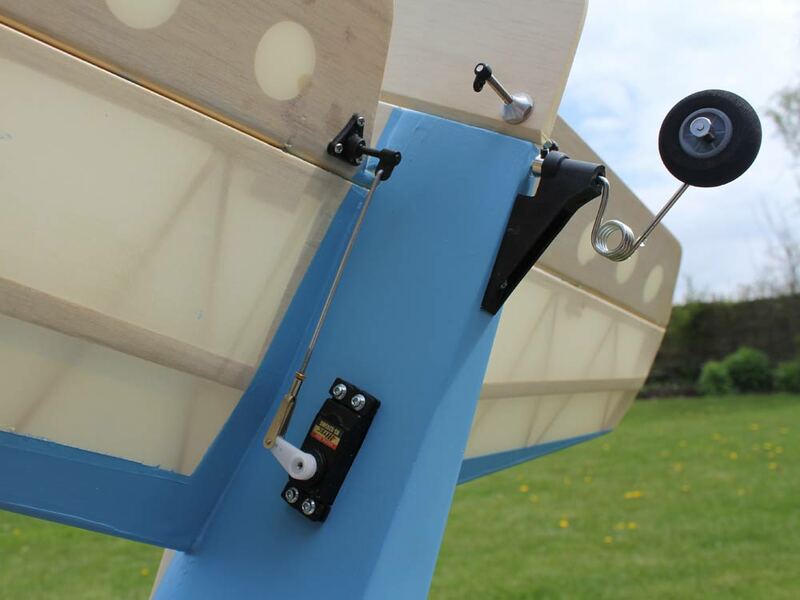 I have decided to build as a tail dragger, have a servo in each wing, which then gives me the option of using the kit torque rods for flaps - any comments, and a servo tucked under the tailplane for elevator. 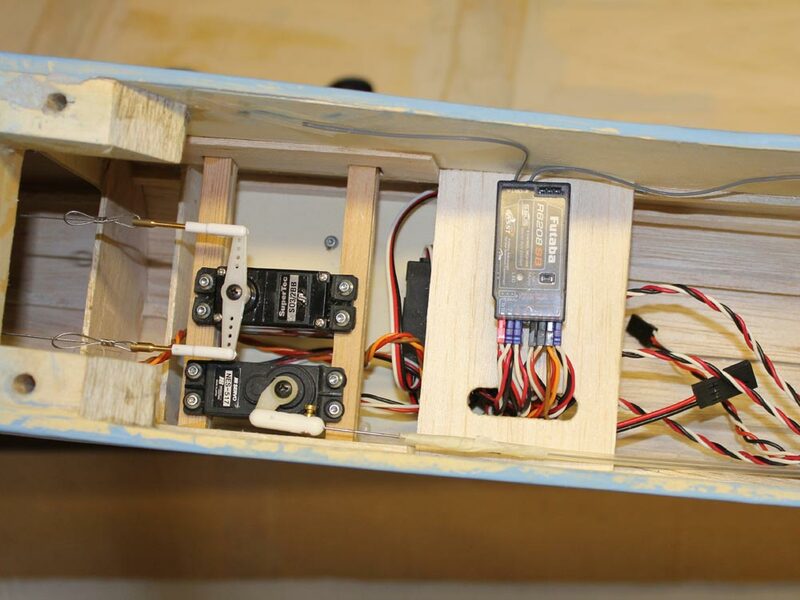 The last image shows the rear fuselage mod to take the elevator servo.